Customer Testimonial – An authentic way to convince your prospect. For each product and service provider day by day it is becoming difficult to come out with something really different. Even if you propose something different then there many are ‘me too’ brands ready to copy and implement your idea. Obviously, this calls for an extensive sales effort. In such a competitive scenario use of ‘Customer Testimonial’ in your marketing material turns out to be really very effective. Suppose you want to buy a mobile handset. To conclude on which brand to go for you initiate the process by gathering details about various brands, may be from internet. You start paying extra attention to mobile handset ads on television and start reading the details of feature and apps in Newspaper, Magazine or Outdoor advertisement. There are higher chances you get confused which brand to opt for with such a bombarding of marketing messages. But you want to buy a mobile phone, your need has not been satisfied. You start observing which brand of mobile is preferred by your friends, family member, colleges or may be boss. At right time you ask them, ‘how is your handset performing, as you are using since long time?’ As an answer if you get to know it is Good, Very Good or Excellent then that answer will be more effective in decision making than your past visit to store or going through various advertisements. Customer Testimonial becomes of high importance when the nature of investment is capital intensive. Let’s say you want to buy a piece of land to construct your home, weekend home or you just want to invest from future perspective. There are many property portals available which gives you ample of information on all type of properties including plotting projects. Specifically Sunday being weekly off, for most of the people, major projects target you through their Radio and Print advertisement in various Newspapers. Apparently each developer will says their project is one fo the bests. However when you inquire on telephone and ask for status on NA, the answer you may get is, ‘NA is in process and we may get approval in coming few months’. On the other hand you read in newspaper, ‘Construction activities banned by forest department in Nalsarovar Area, many investors money at stake’ this increases concern as you are going to invest your hard earned money. 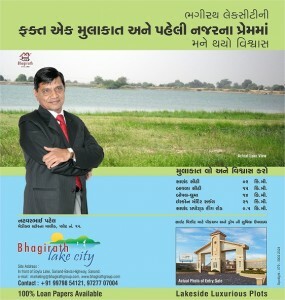 At this point of time if you are exposed to a print ad where a satisfied customer is saying why he made a decision to invest in a particular project, let’s say Bhagirath Lake City, you tend to believe him or her. This happens because the ad features an identifiable character from routine life. With some basic investigation it becomes easy to reach such person and re-confirmation of the fact about project is always possible so the advertiser would not take risk to publish dummies in testimonial. We, Spotlight Communication, as an official creative agency of Bhagirath Lake City selected to use customer testimonial in print ad campaign. 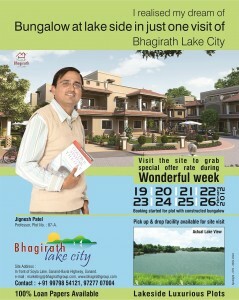 Under this entire ad campaign Spotlight focused on one thing and that was visit of Bhagirath Lake City. Content of ad was prepared around the basic words and experience of existing customers. Customers had been selected from all strata such as Businessman, Professor, Government Employee, Doctor and Retired Bank Officer. 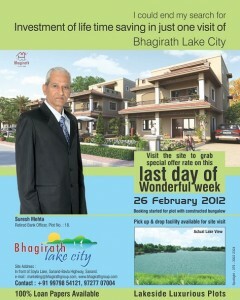 We summarized their experience of first visit to site of Bhagirath Lake City in headline. These headlines communicated, all necessity of life is in proximity, the growth prospect is high, there is a good connectivity with major points of city and its strategic location at bank of Soyla Lake (Natural Lake) adds to the beauty of project. 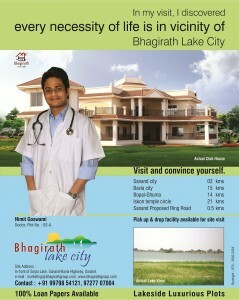 In each ad a single customer was featured with his plot number in project, his profession and crux of his first experience of visiting Bhagirath Lake City. The campaign did wonders as visit to site increased by many folds. This campaign succeeded because testimonial added authenticity to the information. When rest of the competitor were praising their own offerings, Bhagirath Lake City was endorsed by their satisfied customers. When customer’s image and name gets published his reputation also comes at stake if he is just making puffing statements. This helped in building confidence in prospect and it really inspired the ones who were stuck in decision making and waiting for some believable push. Spotlight Communication suggest marketers to come out with customer testimonial ad campaigns to increase authenticity but advise not to use it too frequently.